What was North Beach like during Prohibition? That’s when organized crime got its foothold in the neighborhood. I had always heard that the SFPD had kept the Mafia out of San Francisco. Well, that’s true—sort of. But during prohibition East Coast mafia “soldiers” were in San Francisco’s North Beach in sufficient numbers to control the illegal booze coming into the city. Keep in mind that city voters had overwhelmingly rejected Prohibition. San Franciscans were drinkers legal or otherwise. Figures are not easy to come by for the Prohibition Era, but at the close of WWII our residents consumed not only more booze per capita than any other city in the U.S., but the city was also first in gin mills per capita. During Prohibition speakeasies flourished in North Beach. There was Portuguese immigrant Izzy Gomez’s place at 848 Pacific. The joint became writer William Saroyan’s watering hole of choice. The Hotel D’Oloron on Columbus between Pacific and Jackson was opened by Basque immigrants. What later became Mooney’s Irish Pub at 1525 Grant had a 600 sq/ft speakeasy in its basement next to a Bocce Ball Court. GOING, GOING--This is Izzy Gomez (above, 1944) and his old place on Pacific Ave., favorite haunt of many a San Franciscan in days not so long gone by. 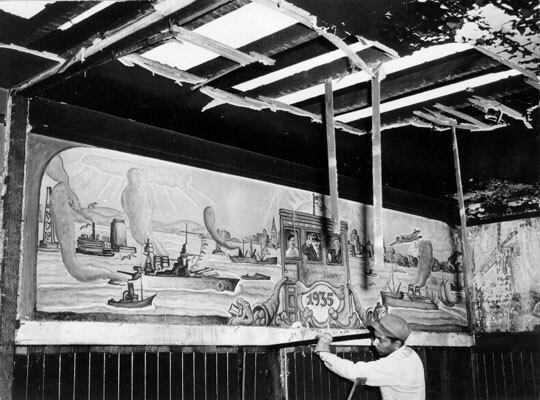 Beneath a sagging ceiling, and oblivious to the faded mural before him, a workman goes about the chore of ripping out the paneling in Izzy Gomez’ place. The old hangout is being wrecked, and many a San Francisco memory goes with it. Nov. 18, 1952. Contrary to the Hollywood depiction of the era, most speakeasies were just rectangular rooms with curtains from ceiling to floor. A waiter took the order, disappeared through an opening in the curtain, and returned with the booze. If there was an unexpected raid the owners simply changed a couple digits in the street address, the color of the curtains and reopened the next day. Of course, there were hundreds of these speakeasys throughout the city. Well, residents had to get their booze somewhere. This is where the mafia and some of their front men came in. 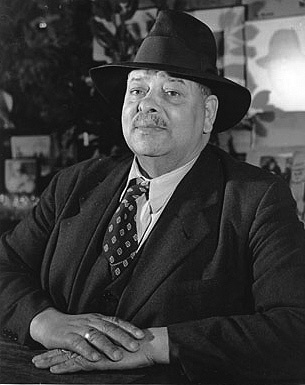 In 1928 Gerri Ferri, the “Don Juan of North Beach,” was the man in charge. He was later found filled with bullets in his bathroom at 490 Lombard. Ferri’s murder set off a four-year power struggle. He was soon followed in power and death by “Genaro the Magnificent” Broccolo, Mario Filippi, Alfred Scariso and Frank Bosch, “the strong man of the Sicilians,” all of whom had brief reigns. The bloodbath ended with the murder of the self proclaimed “King of North Beach Crooks,” Luigi Malvese of 1495 Grant Ave. At one time or another Malvese, had been charged for bootlegging, hijacking, extortion and gunrunning (including a plot to smuggle guns into Folsom Prison). 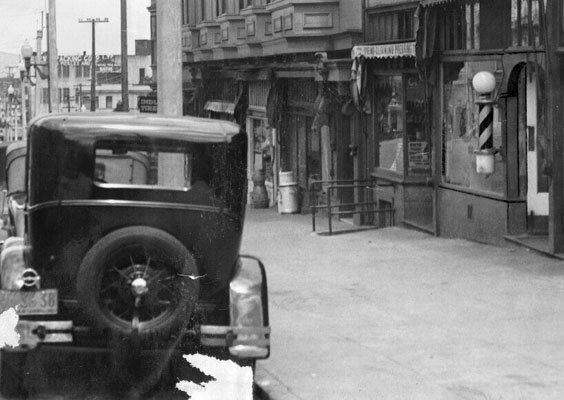 He met his demise just before 6pm on May 19, 1932 in Al Capone style while double-parked in front of the Del Monte Barber Shop at 720 Columbus Ave, now the North Beach Citizens headquarters, but then a gangster hangout. In a scene reminiscent of The Godfather, Mavlese’s passenger, Ralph Ravelli entered the barbershop, leaving “The King” alone. Three men emerged from the shop and one ran to the rear of the auto and began firing. Malvese tried to escape but crumpled to the ground where the killer applied the coup de grace behind his ear. The killer then ran back into the barbershop and disappeared through the back door, into what is now known as “Via Bufano” (or Grover Street for USPS delivery purposes). The barbers and patrons in the Del Monte Barber Shop suffered a bout of “amnesia,” as did most passersby. Ravelli, denied any implication in the crime in spite of the fact it appeared he had set Malvese up. He claimed when he heard the shots he came out of the barber shop, found Malvese dead in the street, dragged him to the gutter and walked away. He was never prosecuted. In 1933 the Volstead Act was repealed and booze flowed again legally. 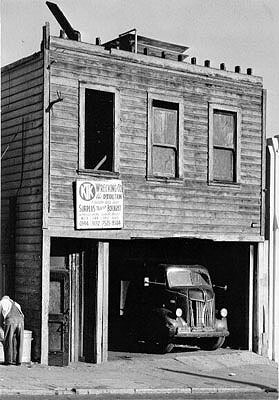 The bootlegging business dried up, and most of the mafia boys left town encouraged by the SFPD. Many years later, in 1958, Gangster Mickey Cohen got rousted big time by the cities finest when he came to San Francisco to see his biographer, Dean Jennings. Chief Thomas Cahill simply said, “I have a sworn obligation to the people of San Francisco to protect them.” The word was out that the mafia thugs were not welcome in the city—even on a literary sojourn. reproduced from The Semaphore #185, publication of the Telegraph Hill Dwellers Association. 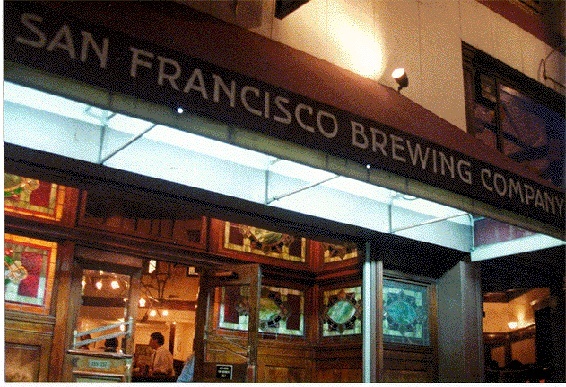 San Francisco Brewing Company on Columbus, mid-1990s. San Francisco Brewing Company, 155 Columbus (at Pacific). This is one of the few remaining historic watering holes in the area that was once the Barbary Coast, San Francisco's notorious waterfront vice district. The pub's nicely-preserved interior dates from 1907; check out the brass-trimmed mahogany bar and accompanying tile spittoon. Gangster Babyface Nelson was captured here, in what is now the ladies rest room. (Don't ask what he was doing in there.) What else? Oh yeah: Jack Dempsey once worked here as a bouncer.